Playmates has just released their Terminator Salvation toys, venturing into the 3¾" scale for the first time. Unfortunately for them, Hasbro has already released a much better killer robot toy in that same scale. 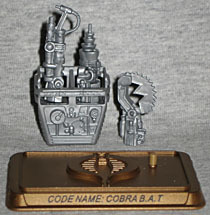 B.A.T.s are the perfect Cobra troopers. They never question orders, complain about the chow, shirk duty, or surrender. They require no leave-time, sick-pay, or benefits of any kind, and they are cheap and easy to replace. On the other hand, B.A.T.s do not react very well to changes in field conditions, nor do they discriminate between targets. They will shoot at anything that moves, be it friend, foe, or animal. They also have an unfortunate tendency to burst into flame when hit from behind. So BATs are the Ford Pintos of combat infantry? I guess that's what you get when you allow an ex-dentist to design your advanced robotics. Unless you're dealing with an omnidisciplinary scientist like Reed Richards, it's never going to end well. At least the BATs worked, mostly; getting a robot to walk like a human being is a pretty huge accomplishment in itself, regardless of whether they burst into flames or not. I missed out on the BAT when he was in stores, but luckily, he was one of the characters voted by fans into the 10-figure Hall of Heroes assortment. The HoH line delivers what are ostensibly "definitive" versions of the included characters, so really, passing on the previous BAT worked out well. The figures' cards have gold foil, rather than the silver seen on the TFAC figures. The blister card is then boxed inside a second package, again with a gold foil tray holding it in place. The price gets driven up, of course, which is the major flaw with the entire idea. Yes, the window box is fancy, but it's still just money going in the garbage. The figure inside is the same mold as the mass-market release, so he's very good. The sculpt is unique, just like the 1986 version was: though the original BAT's legs were eventually used for any number of Vipers, he was all by himself for 11 years before that happened. This version takes all the classic elements and updates them beautifully. 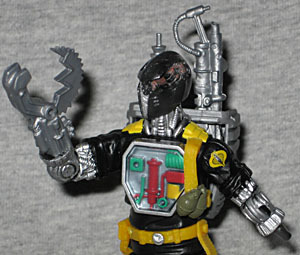 His bare arms look like bundles of pistons, and he has a metallic trachea and spinal column. The chest panel, which used to just be a lenticular sticker, is now a three-dimensional sculpture beneath a transparent cover. Impressive! The previous release had a heavy black wash on the silver portions, but this one has avoided making the same mistake. The head is much smaller than the old toy's - of course, that's true of pretty much every Generation 3 Joe, since G1 figures all labored to stand up beneath their gigantic heads. Now that things are more proportional, the BAT's face is very narrow. 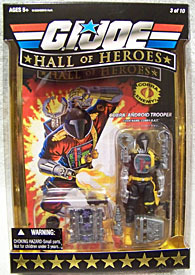 One bonus that this Hall of Heroes version offers over the standard release is the inclusion of a second head. Originally intended to belong to the "Battle Damaged BAT" due in one of the (potentially canceled) 2009 series, the head has obviously seen better days. A blast to the face has cracked the silver faceplate and torn away a section of the outer shell, revealing the mechanics inside - an optical sensor, coils of hose, etc. The heads are easy to switch out, and both look nice. The BAT's accessories are rooted in the '80s, as well. Like the original, he's got a trapezoidal backpack in which he can store his extra pieces. His hands can be removed and replaced with your choice of several weapons: a flamethrower, a wicked-looking clamp, or a blaster of some sort. On the original BAT, only his right hand could be removed. On this one, both hands come off, so you can really turn him into a vicious killbot. 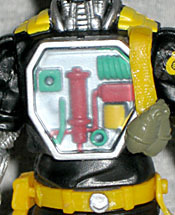 The only real shortcoming is that the backpack only has slots to hold two of these extra appendages, not all three. That's an odd oversight. At least every bit of them looks great. There's a pistol in the holster on his leg, and he includes the usual display stand - molded in gold plastic, rather than black. If you buy the Hall of Heroes BAT, you get another accessory, again coming courtesy of the (maybe) upcoming Battle Damaged BAT: a large gray cannister backpack with two hinged doors. Inside are three purple... things. They look like Bumble Balls. You'd heve to be a pretty big nerd to recognize what they are right away, but hey, that's why you read OAFE; we make sure you get the joke. Those things are "creeper bombs," spores developed by Dr. Mindbender (DDS, advanced roboticist, expert at weaponized botany) which, upon release, grow fast and strong enough to entangle a speeding tank, then produce pods that burst and release sleeping gas. Yeah, that makes sense. The spores, backpack and even the battle-damaged head all come from GI Joe #44, the BATs' first appearance. 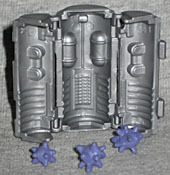 The spores have their own sculpts, and store in the backpack nicely. The Hall of Heroes toys are overpriced, of course, just like Hasbro's various Vintage series, but if you can get the BAT for a good price, he's worth it. You get all the value of the solo-carded BAT, plus (almost) all the value of the Battle Damaged BAT, which may or may not ever be released. The only thing really missing is the battle-damaged chest plate, but that's nothing major. So one figure with all the amenities of two? It makes the price increase easier to take. The BAT is a great figure, and any Joe fan should own at least one version of it.